Nexus 5 has been filmed many times and its design is no secret but its release date surely is. However there are some very strong indications that it might be launched soon because Nexus 4 is Sold out and removed from Google's inventory in US. Google actually forcefully cleared the last stock of Nexus 4 by simply giving $100 discount on the already very cheap phone, that's is a very strong indicator that Google Nexus 5 its latest smartphone will be launched soon. 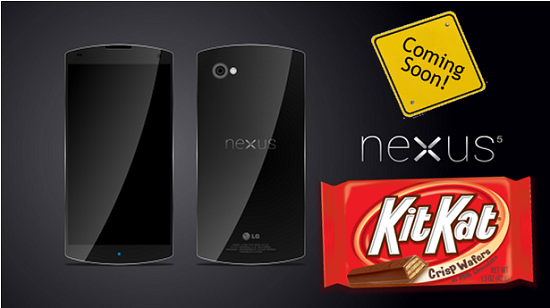 It is also said that Google will launch Nexus 5 and Android KitKat i.e. 4.4 version together. The October month was accidentally revealed by one of the Nestle customers in Germany while replying to a Fan's query on Facebook about when will Android KitKat be launched. As both the smartphone and OS will be launched together its a no brainier that Nexus 5 will also be launched in October. Its for sure that the Nexus 5 will have a very powerful hardware and it will also be very interesting to see if Google improves the camera of its new Nexus as it was highly criticized in its predecessor the Nexus 4.